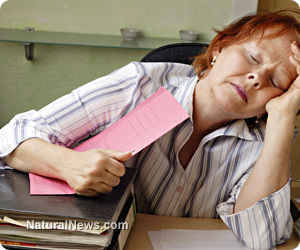 (NaturalNews) "For every minute you experience stress, it takes 60 minutes to remove the flood of adrenal stress hormones from your bloodstream," warns holistic nutritionist Paula Owens in the Alternative Medicine article "The Adrenal Fatigue Fix." Considering the average person is under stress throughout the day, this uninterrupted flow of hormones has caused a modern day public health crisis. But we are usually unaware that the glands are in trouble until it's too late -- when absolute exhaustion, coupled with insomnia, becomes apparent. It's a classic "wired but tired" syndrome. For two such tiny glands, the adrenals exert exceptional power over our well-being. Responsible for releasing "fight or flight" stress hormones - adrenaline and cortisol - the adrenals are designed to keep us safe in times of life-threatening danger. Unfortunately, due to our fast-paced lifestyles, the adrenals erroneously pump out these hormones, oftentimes to the point of exhaustion. "Even if you don't consider yourself a stress monger, modern, everyday life, with all of its traffic jams, deadlines, economic stress, overconsumption of caffeine and sugar, being constantly plugged in and on the go, and never-ending negative media chatter can lead to an overproduction of stress hormones," remarks Jill Grunewald, a certified holistic nutrition coach in St. Paul, Minnesota. Experiencing a second wind of energy around 9:30 p.m. If you find yourself relating to some (or all) of the above, there's a good chance you're contending with adrenal fatigue. And while there isn't a quick fix for correcting the issue, through sound nutrition, supplementation and a few lifestyle adjustments, the road to recovery is possible. The first step to healing adrenal fatigue is to build a solid nutritional foundation. Avoiding caffeine, refined sugar, alcohol and processed foods is essential. Instead, focus of quality protein (grassfed meats, wild-caught fish, pastured eggs, raw dairy, nuts, seeds) and fats (coconut and olive oils, pastured butter). Low-starch vegetables are also important. A full-spectrum salt is crucial, such as a Himalayan pink or Celtic variety. And a teaspoon or two of raw, local honey taken within the hour before bed will help to replenish glycogen stores in the liver, thereby limiting the release of sleep-disrupting stress hormones during the night. Additionally, the following vitamins and herbs are useful for healing the adrenals: B-complex, vitamin C, zinc, ashwagandha and licorice root. Next, its vital to revamp lifestyle habits. A few minutes of yoga, deep breathing or meditation can do wonders for rebuilding the adrenals. Since relaxation exercises send a signal to the nervous system that "all is well," the release of stress hormones is minimized, giving the glands a much needed break. Eating regularly in a calm environment, with a light evening meal before 6 p.m., is helpful too. Finally, self-love is an often overlooked element of healing the adrenals. Carving out quiet time, reducing commitments and slowing down are all aspects of nurturing oneself. In the end, if we truly nourish ourselves with nutrition and positive lifestyle choices, we can experience renewed zest, vigor, clarity and joy.